It all starts with the layup of the hull and all of its components at the renowned Tung Hwa Industrial Company in Taiwan. 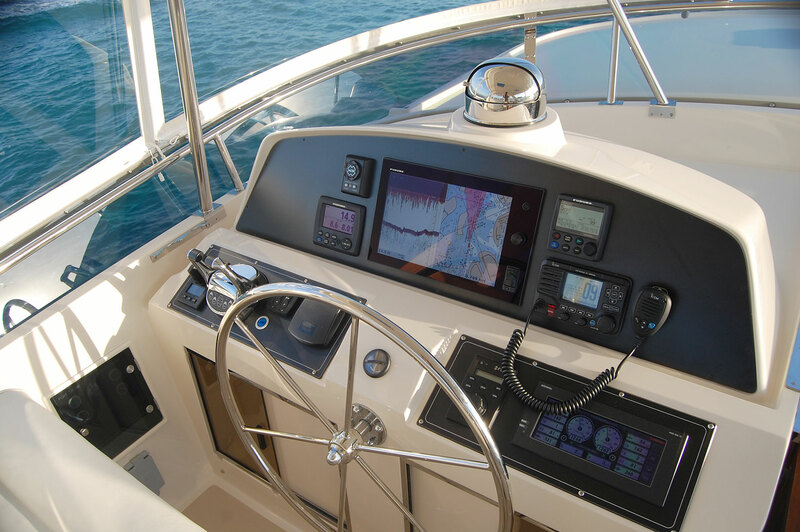 As your hull is being built, we’ll work with you in determining which layouts, configurations, engines, systems, and other custom features best suit your cruising needs. 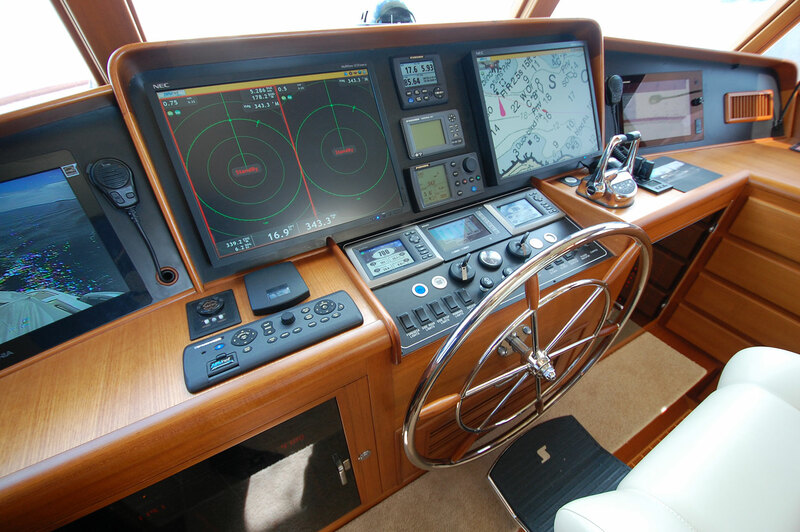 Because a significant amount of time – typically between nine and 24 months, depending on the model – passes between the start of construction on a new Fleming and its delivery to the States, your boat’s navigation and audio-visual systems will be ordered just prior to its arrival. 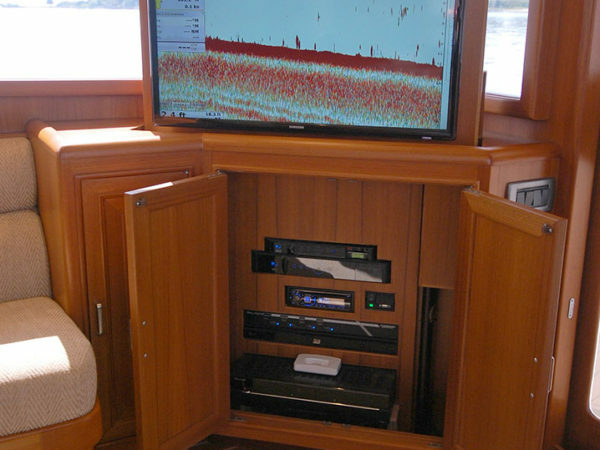 This ensures that your Fleming is outfitted with the most current technology and electronics, all of which have been selected precisely to meet your needs. 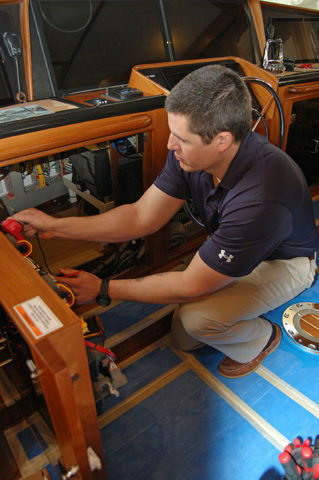 Delaying the installation of your boat’s systems will likely positively affect their warranty period as well. 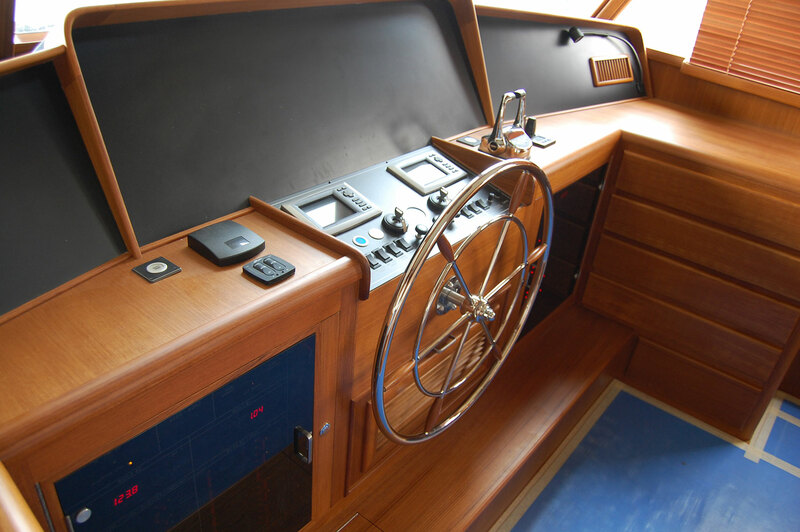 As your boat is under construction, we’ll also work with you in making custom décor selections. 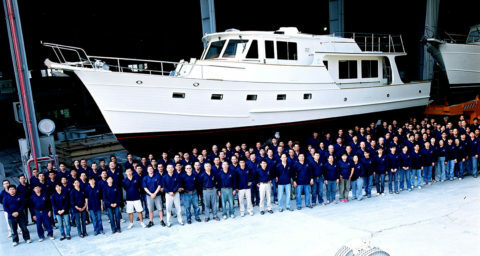 When the hull is complete, your Fleming begins its journey from Taiwan to the Chesapeake via cargo ship. During transit, it is completely safeguarded with protective tape covering virtually every exterior surface, including all glass windows and stainless steel rails. 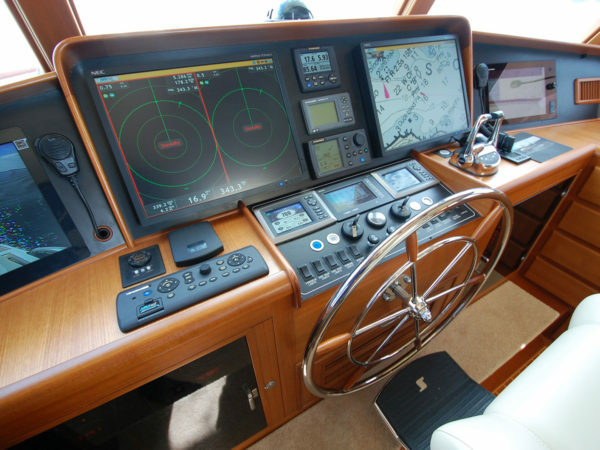 When it arrives at the port, it is met by a team from Burr Yacht Sales and prepared for launch. 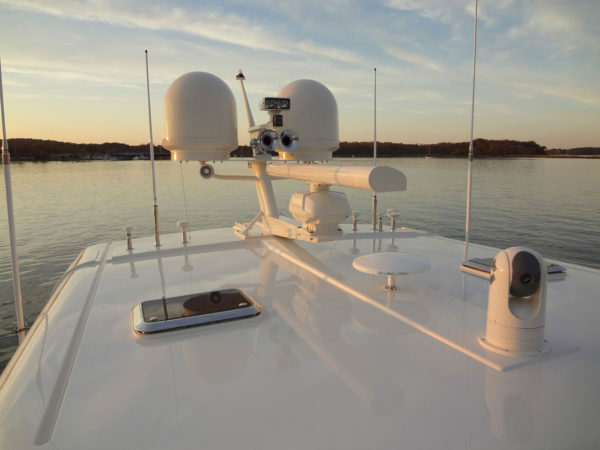 Once paperwork has been completed, and the team has visually inspected the boat, performed an extensive systems’ check, and connected the batteries, your Fleming is ready to be hoisted by the gantry crane and lowered into the water. 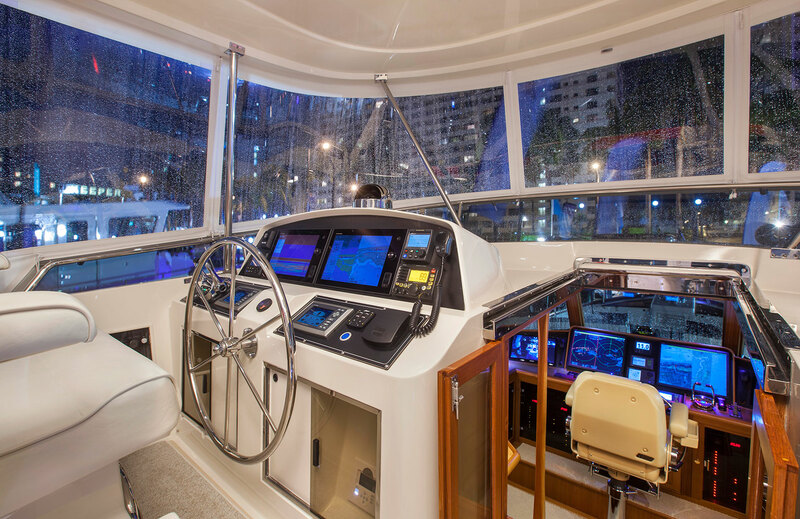 This will be the first time your boat has touched the water since sea trials in Taiwan. 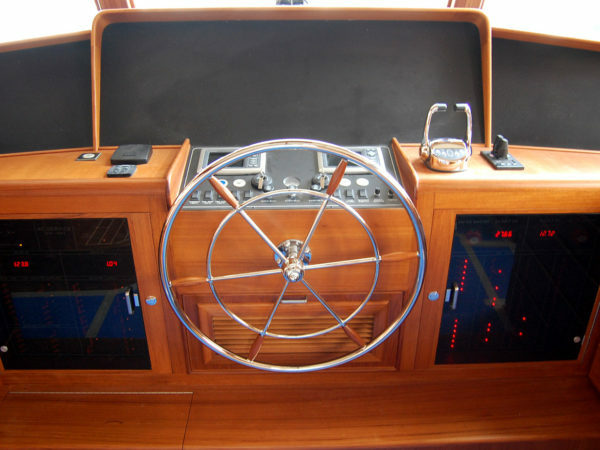 In the case of the Fleming 55, it will be the first time it has ever been in the water. 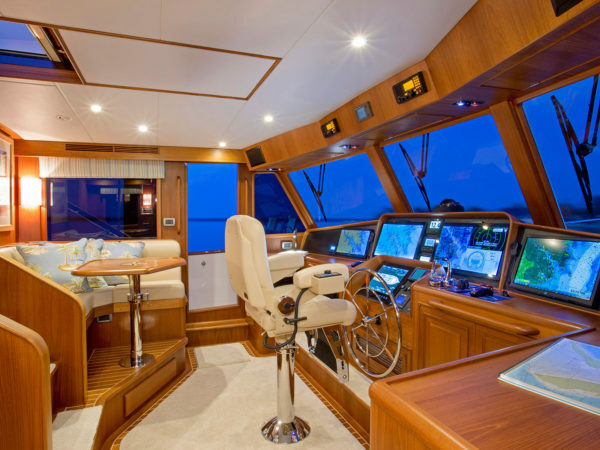 Once it arrives at the Burr Yacht Sales facility in Edgewater, just south of Annapolis, the outfitting process will begin on your new Fleming. 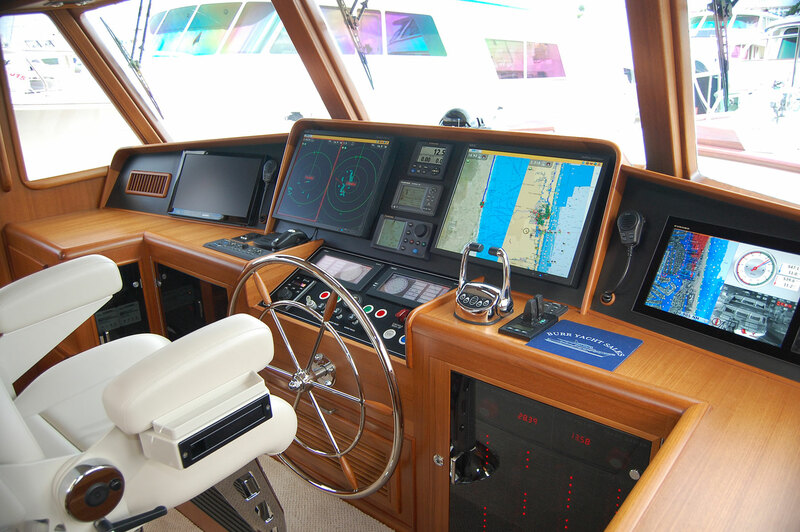 The systems and options selected during your expert consultation will be waiting at our marina, as will any custom décor elements that are able to be ordered prior to arrival. 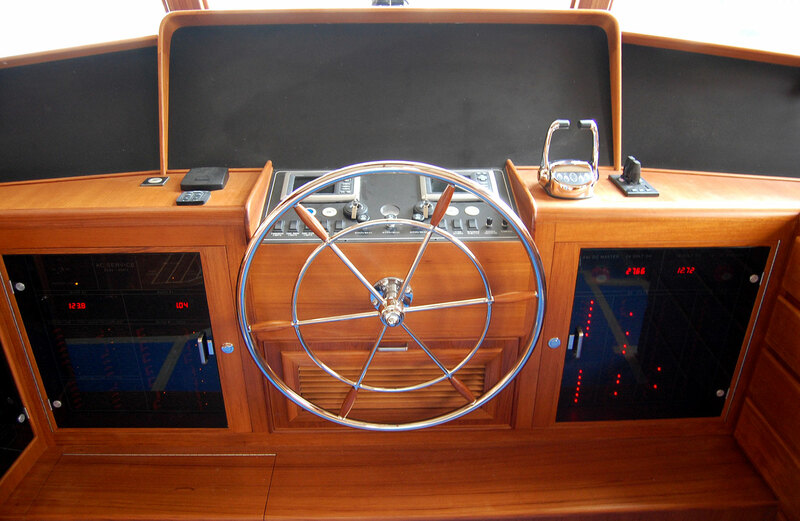 Over the course of the next eight to 12 weeks, our team will transform the already impressive Fleming into one of the most elegantly-equipped yachts on the water. After removing all protective tape from the exterior and giving the outside a wash, we begin installing the flybridge windshield and custom radar mast. 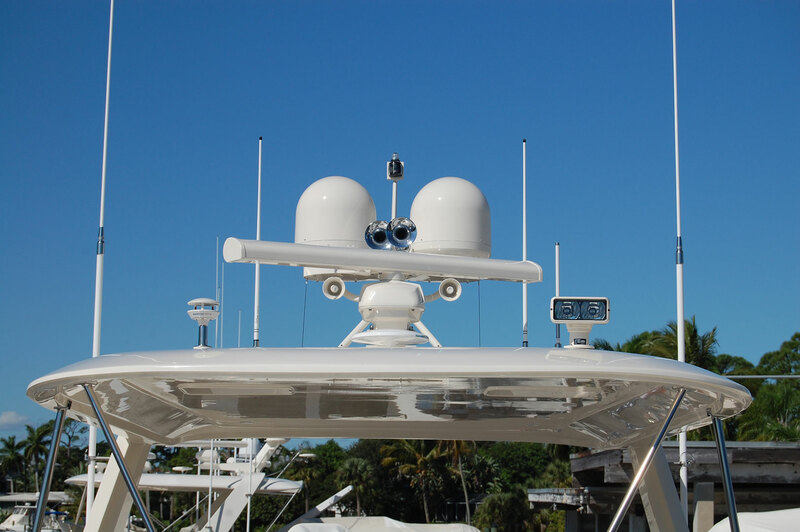 In the case of the 55, the radar arch is lifted and secured, and the fiberglass hardtop is mounted with stainless steel supports. 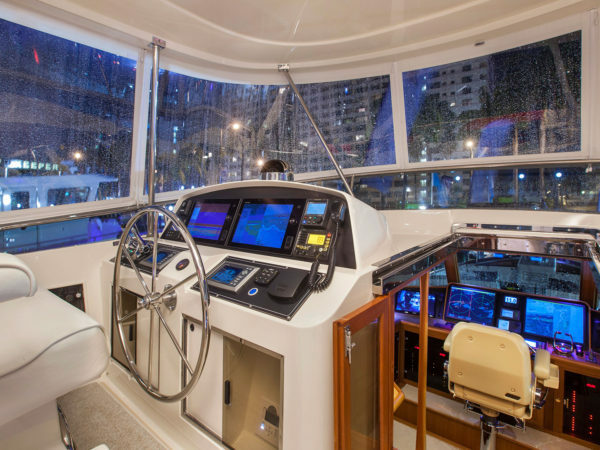 This process takes place in Taiwan for the other models and, of course, the option for a Bimini top on your Fleming is always available. We then move inside and get all of the interior countertops and bullnose surfaces protected with cardboard, tape and foam covers. The teak and holly floors are also covered and protected to ensure that nothing is damaged as we enter the installation phase. 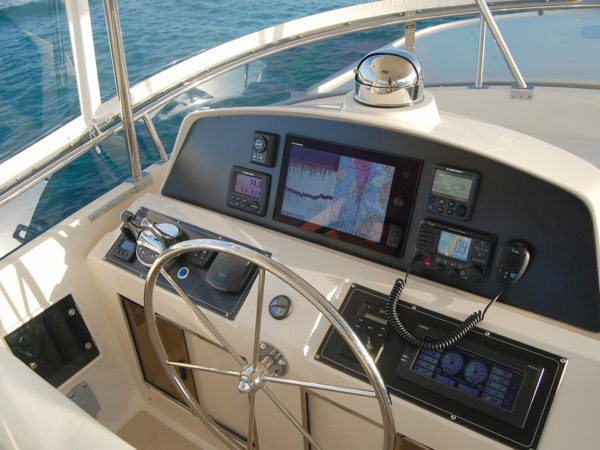 The navigation electronics and systems you selected begin filling out the flybridge and pilothouse consoles as displays and instruments are cut in, wired and tested. 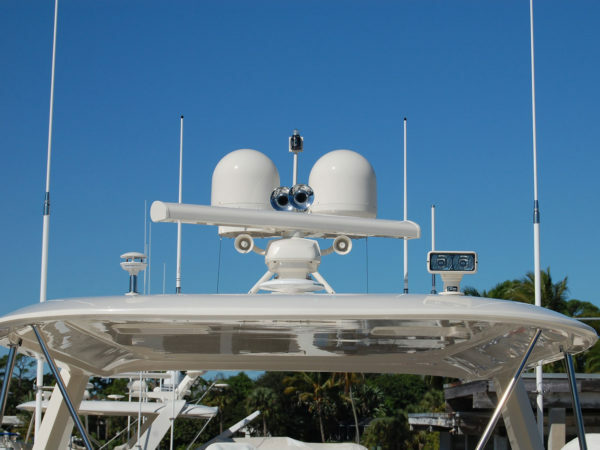 Antennas, open arrays, domes, GPS receivers, spotlights, cameras and other instruments are fixed to the hardtop, arch and mast, with wires run throughout the boat. 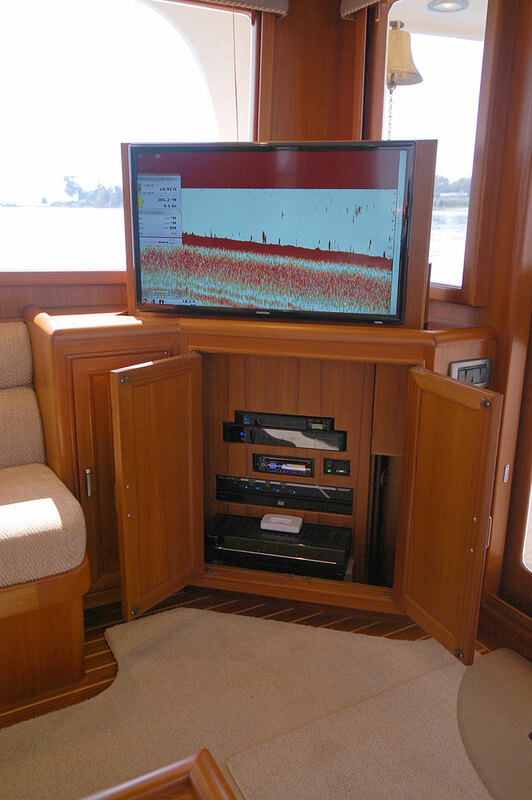 Audio/visual equipment – televisions, speakers, etc. 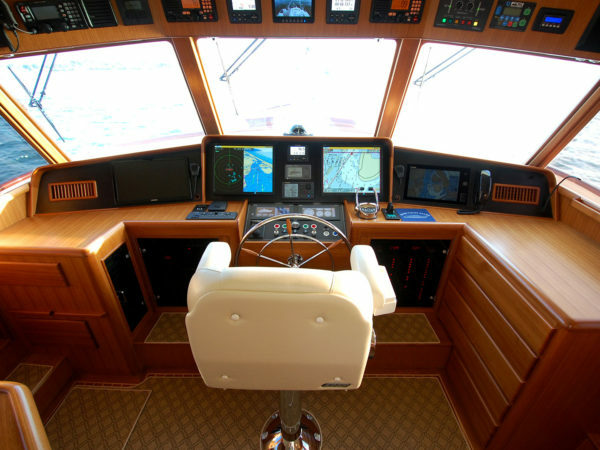 – are installed mounted and connected in the salon, the staterooms, and throughout the rest of the vessel. 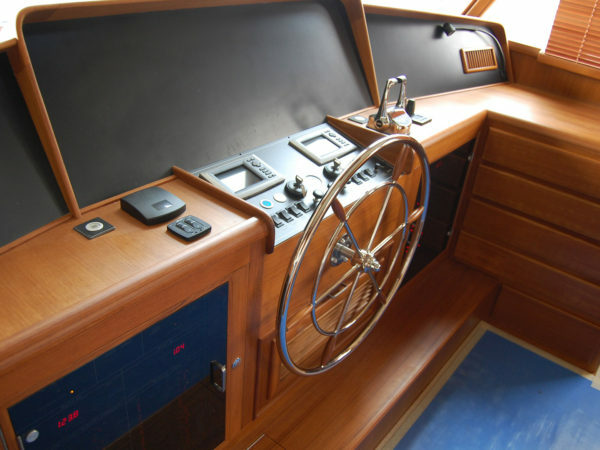 The tender is fine-tuned, secured to the custom-mounted tender chocks, and then fitted with a canvas cover. Measurements are taken for additional canvas covers and enclosures, which are then created, and applied. Safety gear, including an EPIRB, Switlik life raft, and fire extinguishers, are added. Rod holders in the cockpit combing boards are drilled out and fitted. 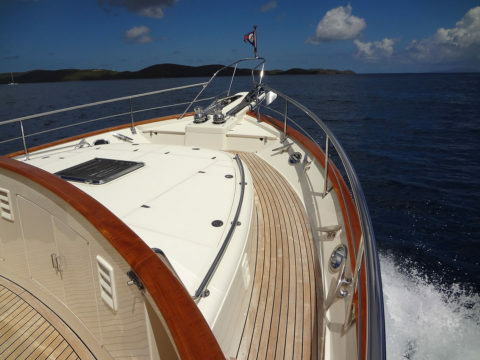 As all these tasks and others unfold, your teak caprails are sealed with 16 coats of Bristol finish or your Burrwood caprails are waxed and buffed to a pristine shine. 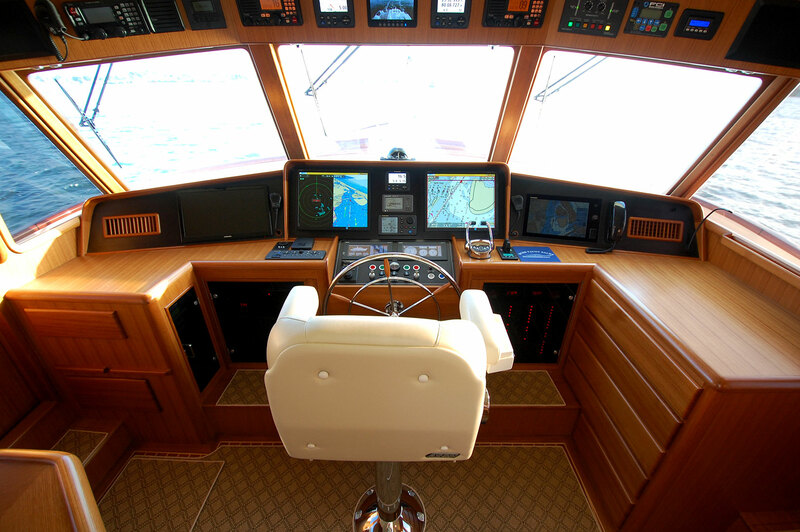 Your Fleming is now ready to be taken out for a final sea trial which will ensure that all of its sophisticated systems are calibrated and properly interfaced. 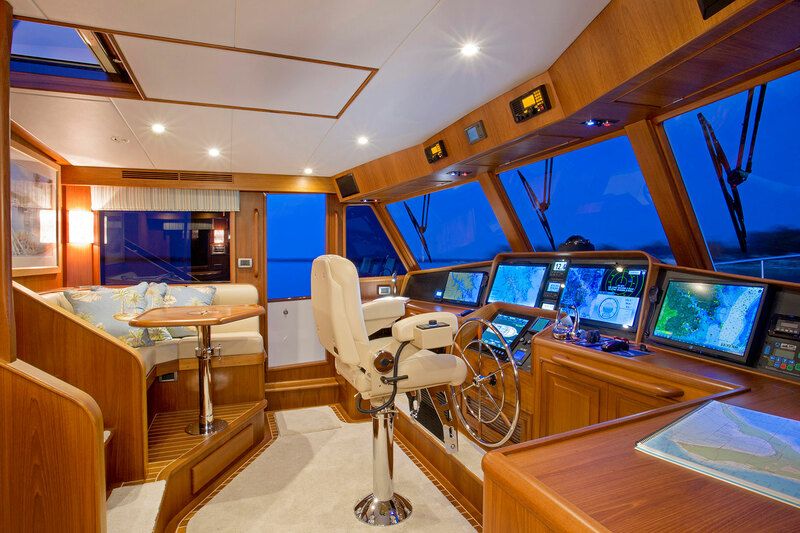 The final touch involves implementing and installing the custom décor you selected for your personalized Fleming, and a full interior and exterior detailing. The day has finally arrived. It has likely been over a year since the hull of your Fleming was born out of drums of resin and countless yards of fiberglass. 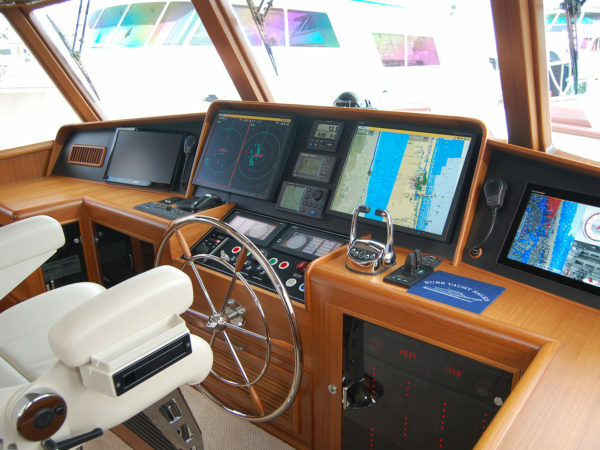 Our extensive training process, which includes reviewing all onboard systems, docking instruction and cruising time, will ensure that when you take the helm, you do it with confidence. She now stands ready to cruise the world at your whim.